Is The Honda Grom The Moped For Grown Ups? | OhGizmo! Is The Honda Grom The Moped For Grown Ups? You could argue that anyone can ride a Vespa-type of moped, but there is a strong contingent that will find it rather emasculating. There’s something about traditional mopeds that only teenagers and girls can get away with, and please don’t shower us with complaints; we’re just stating a known fact about a particular demographic. And yet not everyone that would want to ride a “grown-up” bike has the time, money or inclination to really do so. 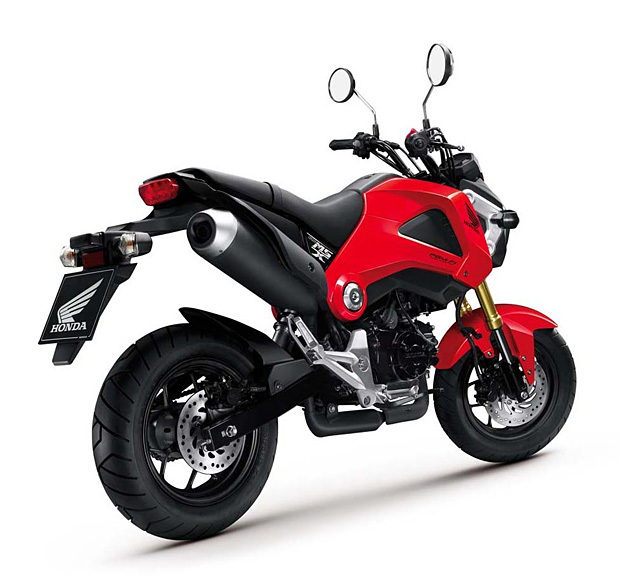 The 2014 Honda Grom appears to possibly bridge the gap between the two. While it’s definitely still a moped, the 125cc motorcycle seems to have enough muscle to please the manly man (or rather the manly 20 something), while still not entering the territory of higher-priced, higher insuranced, higher consuming, full-fledged motor bikes. Starting at only $3,000, you can use the Grom to go to college without spending half your tuition money on real-bike costs and without running as much of a chance of meeting a ditch at high speed. This is NOT a moped. A moped’s motor is started by pedal power: pedal hard enough, and the motor kicks in so you don’t have to pedal anymore. Perhaps you’re thinking of a scooter?